Your BMW 650i Sedan (F06) Coupe (F13) or Convertible (F12) now sounds as good as it looks. 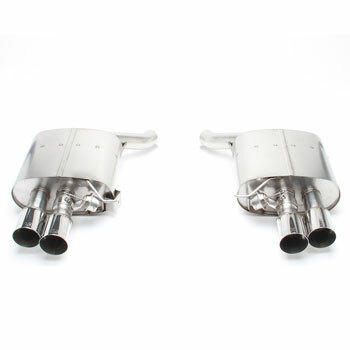 Dinan's Free Flow Exhaust improves exhaust flow by reducing back pressure, resulting in increased power output and a great sporty sound that is civilized when you want it to be and pleasantly aggressive under harder acceleration with zero drone. 100% stainless steel construction and exacting specifications ensure that the system fits correctly using the factory hangers and will resist corrosion for years to come. A vacuum controlled butterfly valve is utilized to improve flow at wide open throttle while keeping things civilized and "drone" free throughout. The design reduces overall weight as well and features 3.5'' black ceramic coated tips for a tasteful high performance look. Gain of 23 horsepower and 15 lb-ft of torque when used with the DINANTRONICS™ Performance Tuner Stage 3 and Intercoolers. DINANTRONICS™ Performance Tuner (D440-1604-ST1 & D440-1604-ST2): The DINANTRONICS™ Performance Tuner is a highly engineered and sophisticated piece of computer hardware and software that enhances engine performance, without negating or voiding your new car warranty coverage and without affecting long term reliability or the functionality of on-board diagnostic systems. It is also the only tuning device emissions legal in all 50 states. The ultimate objective of developing this piece of technology was to provide the ability to control every signal entering and exiting the BMW factory Engine Control Unit. These items are unique to Dinan and together they embody the apex of performance engineering in a powerful, reliable, and warrantied package. High Performance Air-to-Water Intercoolers (D330-0017): More power, great looks, more consistent performance and no downside by upgrading to the Dinan High Performance Intercoolers for the N63TU V8. Heat is the enemy of horse power, beat it by replacing the air-to-water intercoolers with larger units from Dinan to reduce the charge air temperature. Add an impressive 23 horsepower and 15 lb-ft of torque when used with the DINANTRONICS™Performance Tuner as well as the Dinan exhaust.